What do eggplant skins, charred wood and slivers of paper have in common? 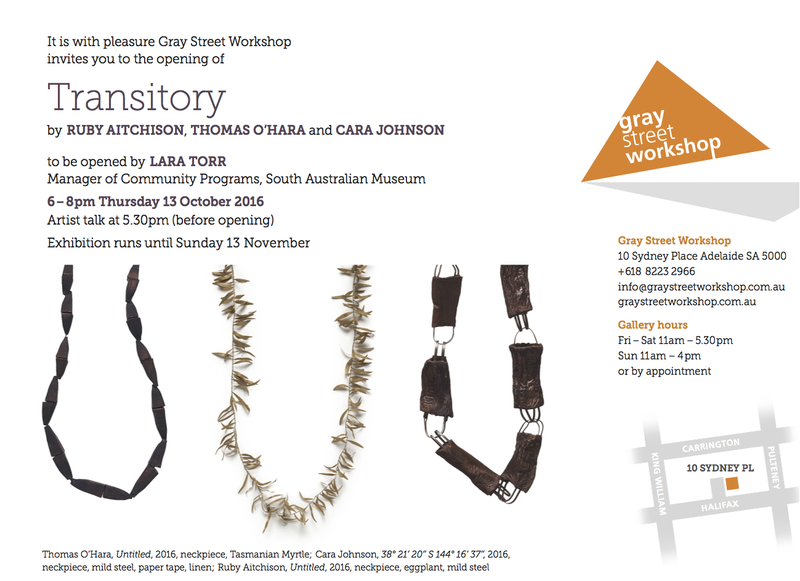 The answer is...all these unusual materials are used by artists Ruby Aitchison, Thomas O'Hara and Cara Johnson in their collection of jewellery and objects on exhibition in Transitory at Gray Street Workshop Gallery from 13 October 2016. Contemporary jewellers are known for challenging conventions and this trio is no exception. They have a shared interest in the transitional qualities of natural materials and processes that are used to transform them. Their materials of choice are simple and common, however the skills and techniques they employ result in fantastically intricate and textural pieces. Cara is inspired by the natural passage of time and uses the fragility and impermanence of paper and fabric to reference this. Thomas introduces an element of risk to his work by burning the surface of his wooden components. Ruby creates leather like forms by stretching eggplant skins over small steel structures. It's jewellery with a difference, it's intriguing, it's unusual, it's inventive and it's a must see. Transitory is a fashion statement of another kind, a statement about time, the transitory nature of materials and the ingenuity of the creative spirit. The artists will be in Adelaide for the opening of the exhibition and will be giving artist talks in the gallery.